Undoubtedly, one of the essential skills to negotiate complexity is creativity. Many feel that creativity would be the number one skill and mindset for the 21st Century. I also feel so. b) to innovate solutions to resolve complex issues. Though every human being is born creative it takes persistence, patience and deep reflection to hone it to the level of effortless skill. However, one of the easy ways to maintain it is to ‘hang out with freaks’. This has been one of my mantras from childhood. And it has never failed me. At least I keep getting inspired. Here is a complex problem creatively resolved by two of my ‘freak’ friends, Mr. Sudhin Gupta and Mr. P. K. Guha, who make their living by offering their innovative solutions. The state Government of West Bengal, India, wants to build a major water pumping station at Belur, which is on river Hoogli. To do that they would need to drive concrete piles into the river bed to build the foundation on which the water pumping station would come up. However, CESE (Calcutta Electricity Supply Corporation) the local electrical utility company, raises an objection. They know that many high tension marine cables are lying in and around the very spot of the proposed pumping station. But they aren’t quite sure about where precisely these cables lay. These cables provide huge power to some of the big industries built on the river banks. So if any one of these is punctured in the process of driving concrete piles it would be a disaster with consequent hazards. At the same time, the water pumping station has to come up in time for two reasons. First and foremost to provide good quality drinking water to the people. Second it is being built with aid money from the Central Government. If the job is not completed in time the aid money has to be returned. That would be a major setback for the growing population in and around that area who would be deprived of good quality drinking water. So that is the dilemma waiting for a resolution. 2. Finding the exact location of the cables can’t stop the civil work which has to be completed in time. 3. Utmost safety is to be ensured during the procedure. One silly mistake can prove very costly. 4. It has to be very cost effective. 5. And the level of the river rises or falls by 6 meters during tide and ebb. Hope you find the problem challenging enough. The video that follows gives the innovative solution that worked so well. But before viewing that take some time to think of a possible solution. Request: If you have any question please do ask in the comment box. I shall try to answer as best as I can. It feels good to notice people who are thinking of ‘sustainability‘ and trying their best to contribute towards that goal. Here is an example of a possible contribution to sustainability. 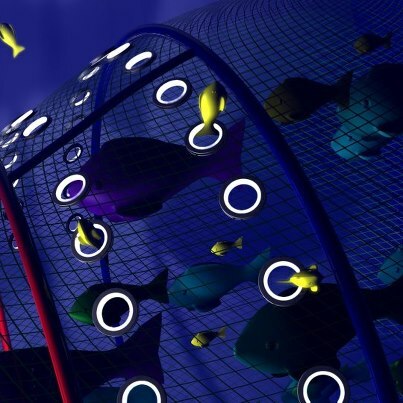 An innovator designed a fishing net to protect and enhance sustainability. The idea is to let out small fishes in a catch while retaining bigger fishes. The smaller or baby fishes are set free to go back to their natural habitat unharmed to grow to full size so that they can reproduce more fishes as they grow into adults. No doubt it seems to be a noble idea. An idea full of feelings. But my conjecture is that this would not help sustainability. In fact it can harm it. What do you think of my conjecture?